Queen Victoria Inn - A Division of IBC Holdings (Australia) Pty. Ltd.
ABN: 38 001 777 939. Approximately 70 minutes from Sydneys CBD, all on bitumen roads to our front gate. Helicopter flights are available. If you are travelling from Sydney, take the Old Northern Road through DURAL, pass through GLENORIE, MAROOTA and follow the signs to WISEMANS FERRY. Once at WISEMANS FERRY, proceed down the main street past the Pub and Bowling Club a few hundred metres to the river and free ferry crossing. On the other side of the Hawkesbury River signs will tell you to go either right or left ... YOU TURN LEFT up Settlers Road, drive towards St ALBANS for 5 km and you will reach THE VICTORIA INN on your left, you cannot miss it. 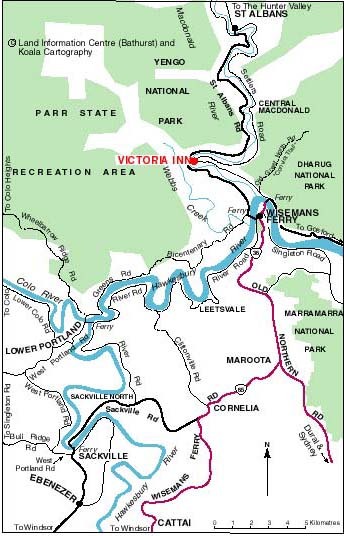 For those travelling from the Central Coast we recommend you come via PEATS RIDGE and SPENCER where you join Settlers Road and follow the very picturesque northern shore line of the Hawksbury River past the ferry crossing to the Victoria Inn. Duration approximately 75 minutes. VICTORIA INNS four chimneys are prominent above the grey roofed two storey sandstone building which faces the grazing farmland in the bend of the Macdonald River with the majestic cliffs towering behind ... we also have IDENTIFICATION SIGNS. Copyright © 2000. Queen Victoria Inn. All rights reserved.